Pillows of this small size are believed to have been used for resting the hand on while taking the pulse. The inscription of the present piece states that it was ‘respectfully made on the auspcious first day of the eighth lunar month in the autumn of the jiashen year of the Tonghe period by the Military Commissioner of Chengde and … of the Chief Administrative Office of the Auxiliary Palace, Liu Chenggui, for the Treasury of the Palace Medical Service of the Chongde Palace. Other pillows with a different design are known to have been commissioned by the same official for the same Palace in the following year. The rectangular piece has straight sides and base, and a concave top. 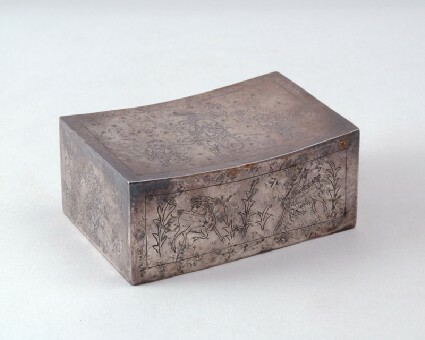 The top is engraved with a spotted deer lead on a leash by a small boy, with another boy following with a lotus pod. The boys are depicted with a large head with big eyes and little hair, wearing short jackets, trousers and a pearl string around the neck, the second one captured in an animated pose, as if dancing. The deer carries a tablet on a flower-decorated saddlecloth, inscribed with the wish chang shou (‘extended long life’) between a lotus flower and leaf. The whole scene appears against a ground with triple ring motifs and is enclosed by a single line. The front and back show a pair of spotted deer among simple serrated leafy plants, the sides a double vajra (Buddhist thunderbolt) motif and floral corner designs. The base is engraved with a 36-character inscription.